This tour builds on Brooklyn 101 neighborhoods, adding Fort Greene & Clinton Hill. 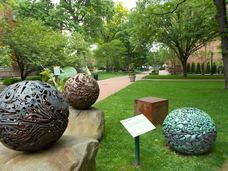 We see row houses, mansions, parks, colleges, and a great sculpture garden. This extensive tour of neighborhoods in the Brownstone Brooklyn belt combines major segments of the Brooklyn 101 tour (Park Slope, Brooklyn Heights) and the Fort Greene & Clinton Hill tours. We meet near Brooklyn's magnificent Grand Army Plaza, the psychic center of Brooklyn. We'll see some marvelous architecture and get a feel for Park Slope, the city's most livable neighborhood, according to New York magazine, an epicenter of the borough's gentrification yet also boasting the country's largest co-operative grocery. We'll visit Brooklyn's most famous park, Prospect Park, a cousin to and contrast with Olmsted & Vaux's earlier Central Park, and see the Soldiers and Sailors Memorial Arch. On Saturdays, there's a Greenmarket outside the park. If it's open, we'll step into the Brooklyn Public Library's Central Library, which always has local art or photography exhibits. We'll continue past the Brooklyn Botanic Garden (maybe go in) and see the Brooklyn Museum's imposing facade. We subway to Fort Greene and explore this fascinating neighborhood (arts, black culture) and its neighbor, Clinton Hill, including the Pratt Institute and its magnificent sculpture garden. Both have fantastic architecture. We then travel by subway to the institutional heart of Brooklyn, home of Borough Hall, Brooklyn's old City Hall, and see part of Downtown Brooklyn: older skyscrapers, new developments, and an array of governmental buildings. Our route takes us into Brooklyn Heights, the city's first historic district and still a vital residential neighborhood. At the Brooklyn Heights Promenade, we find glorious views of the Manhattan skyline and the Brooklyn Bridge. After a look at Brooklyn's most famous church, we end at Fulton Ferry, near DUMBO, where there are numerous options to snack and eat. That means we'll have seen four or five of the borough's great--and increasingly pricey--neighborhoods.